We can’t imagine the Judicial Ethics Commission ruling against Judge Nance for doing what the law requires him to do—recuse himself if he believes his views might bias a case. And we can’t imagine how the groups now trying to unseat him claim to be in favor of tolerance and diversity while at the same time trying to hound from office public officials who don’t agree with their politically correct ideology. Recusal is generally an inability to fairly judge an individual case. What this judge has done is to recuse himself based upon an irrelevant characteristic of an entire group of individuals. Moreover he is doing so based upon (presumably) religious mythology that is contravened by a large body of peer reviewed scientific research. At this point the fitness of gay people to be parents is an established fact. Whether of not some Christians disapprove of gay people based upon ancient mythology is irrelevant. 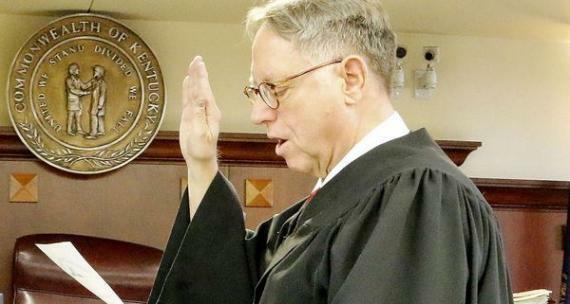 Would there be any question if this judge said that he will not hear any adoption or foster care cases if one or both prospective parents are Jewish because Jews indoctrinate children to hate Christians which is not in the best interests of the child? Why is sexual orientation any different? Cothran is also being ridiculously trite. They keep trotting out this absurd argument that intolerance of intolerance is unjustifiably intolerant. Furthermore this has absolutely nothing to do with ideology or political correctness. Allowing gay people and gay couples to adopt or to be foster parents is required by law.